… better grades and more time with friends! This page contains guidelines on how to properly format the headings of your research paper using the MLA format. Font: choose an easy to read font such as Times New Roman. Font Size: set the font size to be twelve (12) throughout your research paper, including your paper’s title. Never set the font site larger than 12. Margins: 1-inch for top/bottom/right/left throughout your paper. Double-space: double-space throughout your paper. Don’t add extra spaces (besides double-space) between your headings, your title and your paragraphs. A sample of the first page of your paper. For the pages that follow the first page, set the heading like this: instead of the whole heading, you would use the header feature on your word processing program and including the following information: Your Last Name and the Page Number. Example of the heading for inner pages. Every research paper must include a works cited page. The works cited list is placed at the end of your paper, on a new page. The heading for your works cited pages should be the same as the heading for your inner pages, which include your name and the page number at the top. 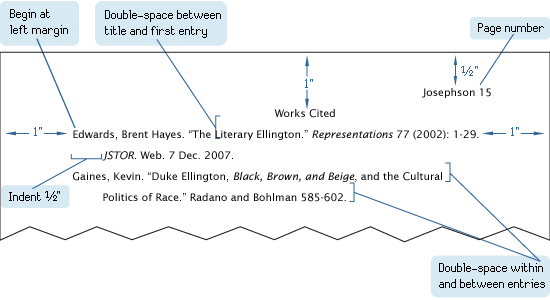 Enter the title as “Works Cited” and place this title 1-inch from the top of the page, see more details in the example illustration picture below. Example of the works cited page. Cool. But how many grade school students will look at this website to see how to set up their papers. Wow, This site is amazing! Project management office and (pmo) metrics team. Should the abbreviation pmo be in lower case as it is or should it be in upper case? So for the works cited page, you don’t need the name, teacher, date, and period heading at all? This is some good stuff to know. I have to write a paper for an application and they want it to be in MLA format. I don’t know how to do the heading because it’s not going to one teacher in particular and it is not for one class. I don’t think you need a heading besides the “Last name-1” on the inner pages. Copyright © 2011–2019 • MLA Format • All rights reserved. Currently, MLA is at its 8th edition. This website has no official relationship with the Modern Language Association and is not endorsed by the MLA.